Introducing Exclusive Candy-Filled Holiday Gift Boxes! Spread some cheer this holiday season with our exclusive Christmas candy gift boxes. They’re already filled with candy – we’ll do all the work! Simply choose your box (Santa or O Holy Night) and your recipient (child or adult, to determine the types of candy we’ll include). They’re great for Christmas parties among coworkers, classmates, church groups, and more. 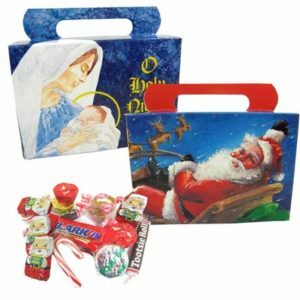 If you’re in need of more than 100, Christmas candy gift boxes, please call us at 800-698-3536 for special wholesale pricing! Add it to other treats: Chop up your Kit Kats and Reese’s Cups to add them to ice cream or cookies, or mix in your M&M’s with your trail mix. You can even add them to your morning pick-me-up – Butterfinger Frappucino, anyone? Freeze it: Stick your leftover candy in the freezer to save them as accessories for your gingerbread house this season. Donate it: Participate in the Halloween Candy Buyback to brighten the day of an American Hero.